One of the best Rhododendrons for the combination of flowers and foliage is Rhododendron Floral Sun. This is a hybrid (Rhododendron sino nuttallii x R.W.Rye) and it takes the best from both parents. We have always loved Rhododendron nuttallii, however it is slow to flowers and tends to get a little large for most gardens. It is the trumpet like flowers and the heavily textured foliage that appeal. We do grow it in our garden and love it when it flowers. Rhododendron Floral Sun offers us something a little different. It is smaller growing, flowers earlier on in life, and has a little yellow in its trumpet like flowers. The flowers are fragrant, opening from golden buds in spring. A very attractive white with a buttery gold centre when new, fading to paler yellow to white later on. 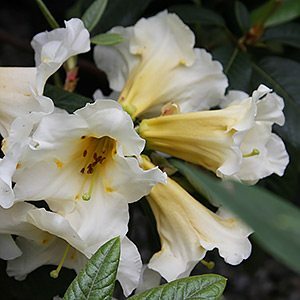 If you have a position in afternoon shade, and a humus rich moist soil, Rhododendron Floral Sun will thrive. Dappled shade through the day works very well. A frost free position is recommended as this prevents damage to the new buds as they form. Like all Rhododendrons, a slightly acidic soil is best. Dig in some well rotted compost and aged cow manure before planting. A little blood and bone will help. Dig over the soil well, an area twice as big as the pot is recommended. Plant, backfill and water in with some liquid seaweed fertiliser. You will need to water through the first summer. After this watering will depend on the climate and soil. In a good position, little water will be required. The hotter the climate and the more sun the plant receives the more water it will need. Can you grow Floral Sun in a container ? Yes, in a shady position in a courtyard it will do well. Expect it to reach around 2 metres in height in 10 years. Easily pruned back if needed.